Centrally located in Northampton and with easy access to the UK’s motorway network, we are ideally positioned to operate at all of UK’s main exhibition and conference venues. We also serve mainland Europe and can accommodate locations even further afield. Within these extensive and fully equipped premises our team of dedicated personnel ensures that we able to design, produce, install and store custom-built and modular exhibition stands of all shapes and sizes. The Design Office is where every exhibition stand begins. Working from your brief, our team of 3D designers will conceptualise a design before creating visuals to accurately show how the finished stand will look. Once a design has been approved our design team will produce production drawings along with plans for submission to the event organisers and electrical contractors. In the workshop our team of carpenters, decorators and machine operators will take your exhibition stand design and skilfully turn your concept into reality. If your design is particularly complex or has repetitious elements our CNC team will meticulously draw up each component for precision-cutting by CNC, ready for assembly. Less complex items will be processed by experienced carpenters using a range of modern machinery available within our fully equipped workshop. 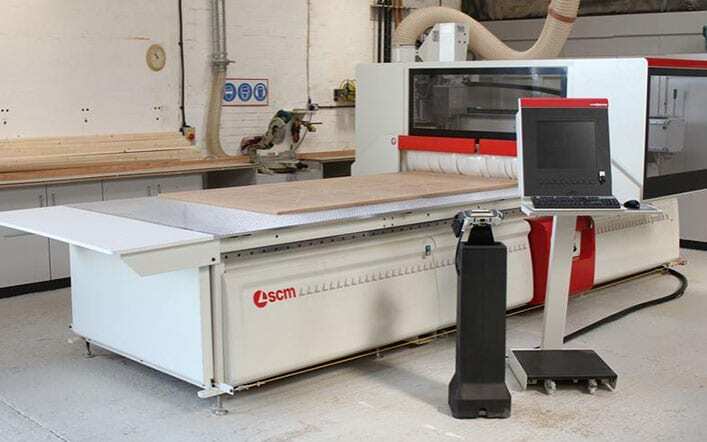 To ensure that your exhibition stand is produced to the highest standards our workshop currently houses an extensive range of panel processing equipment such as the SCM Pratix S15 flatbed CNC, Altendorf F45 ELMO panel saw, a semi-automated Striebig wall saw and a fully automated edge banding machine. Continued investment in the latest machinery means that we always have the capability to manufacture the most demanding of exhibition stand designs to highest possible quality. With 50% of our main premises dedicated to secure exhibition stand storage plus an additional 4500sq/ft of offsite storage available, we now offer a total exhibition stand storage area in excess of 12500sq/ft. 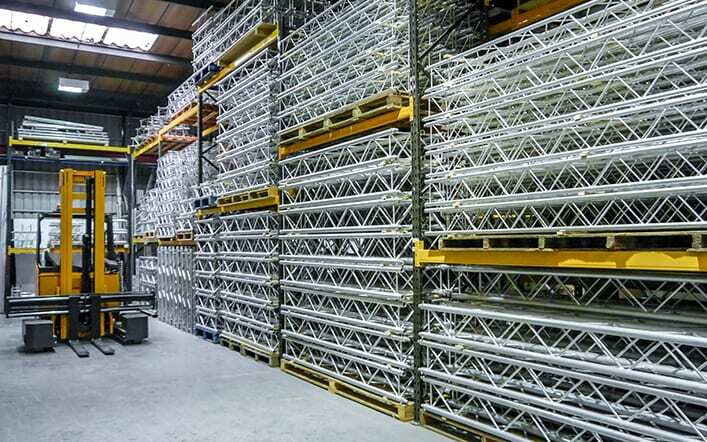 Our fully racked storage areas, accessed by our four-way narrow aisle fork lift truck, allow us to accommodate exhibition stands of all shapes and sizes cost-effectively and with the minimum fuss. This “in-house” facility ensures that your stand materials are kept dry and secure in a protective environment and can be readily accessed whenever they are needed. We currently operate three extra-long wheel base 3.5 tonne Iveco Daily Vans as they are versatile and reliable vehicles and, with their voluminous carrying capacity, are ideal for safely transporting exhibition stands and equipment around the UK. As well as the 3.5 ton vans we also operate two 7.0 Tonne Iveco Daily trucks. One is a 7.0T curtain with tail lift, the other a custom-bodied 7.0t chassis with lockable container doors along one side and a full height tail lift at the rear. We also operate a VW Transport crew bus, ideal for shipping exhibition stand installers and their tools to UK and European exhibitions, and a small Citroen Berlingo for all those other little errands that need doing. 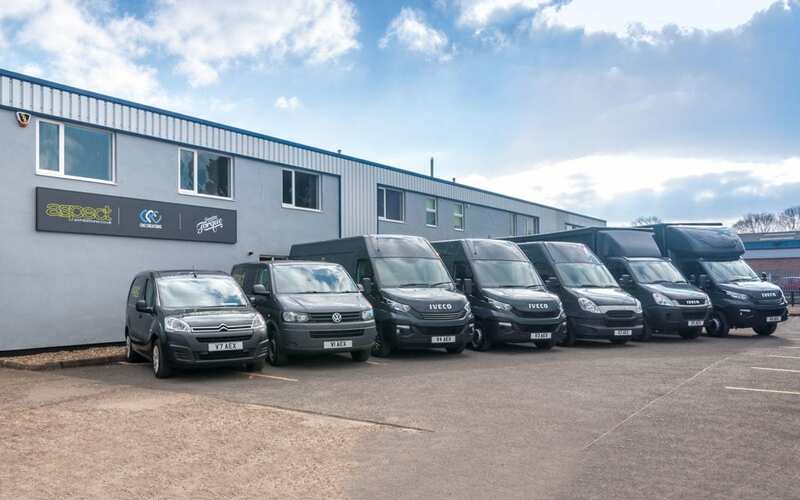 Our fleet of vehicles ensures we are able to provide efficient exhibition stand transport and installation services throughout the UK and mainland Europe at the most competitive price.